Mixed ability pilates classes... small classes for more personal tuition... fun, effective and sometimes challenging. Introduce a friend to my class and both you get that session half price. 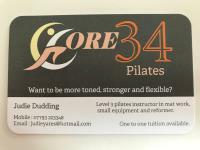 Check for class details, dates, special offers and useful information regarding my classes and pilates. Clean and lovely hall space... Easy parking, toilet facilities. Book 4 or more consecutive sessions and pay £8 per class... Introduce a friend and you both get that session half price. Please bring own exercise mat and small towel and water. All other equipment supplied by me.